Republican presidential nominee contender Newt Gingrich said Saturday he would favor the use of the death penalty against Mexican drug trafficking organization leaders. The comments came in an interview with Yahoo News in which the former Georgia congressman and Speaker of the House also called medical marijuana in California "a joke" and suggested he would try to make life miserable for US drug users as a means of driving down drug use rates. Gingrich is now a leading contender for the Republican nomination. According to Real Clear Politics, which averages all polls, Gingrich is in first place nationally with 23.8%, ahead of his closest contender, Mitt Romney, who has 21.3%. "My general belief is that we ought to be much more aggressive about drug policy, and that we should recognize that the Mexican cartels are funded by Americans," Gingrich said. When asked if he stood by his 1996 legislation that would have given the death penalty to drug smugglers, he replied in the affirmative. "I think if you are, for example, the leader of a cartel, sure," he said. "Look at the level of violence they've done to society. You can either be in the Ron Paul tradition and say there's nothing wrong with heroin and cocaine or you can be in the tradition that says, 'These kind of addictive drugs are terrible, they deprive you of full citizenship and they lead you to a dependency which is antithetical to being an American.' If you're serious about the latter view, then we need to think through a strategy that makes it radically less likely that we're going to have drugs in this country." Gingrich suggested that Singapore, which imposes corporal punishment for minor offenses and the death penalty for drug offenses, was a role model. 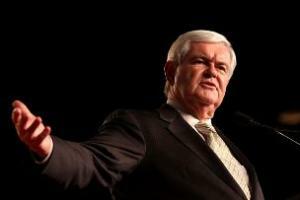 "Places like Singapore have been the most successful at doing that," Gingrich said. "They've been very draconian. And they have communicated with great intention that they intend to stop drugs from coming into their country." For Gingrich, being aggressive on drug policy also "means having steeper economic penalties and it means a willingness to do more drug testing." He elaborated on what he had in mind in response to another question: "I think that we need to consider taking more explicit steps to make it expensive to be a drug user," he said. "It could be through testing before you get any kind of federal aid. Unemployment compensation, food stamps, you name it." Gingrich said that he wasn't a fan of imprisoning drug users and instead suggested that they be subjected to forced drug treatment. "I think finding ways to sanction them and to give them medical help and to get them to detox is a more logical long-term policy," he said. Regarding medical marijuana, Gingrich, said he would continue current federal policy "largely because of the confusing signal that steps towards legalization sends to harder drugs [sic]." He also rejected letting states set their own policies "because I think you guarantee that people will cross state lines if it becomes a state-by-state exemption." He also threw in a gratuitous jab at California's medical marijuana law. "I think the California experience is that medical marijuana becomes a joke," he said. "It becomes marijuana for any use. You find local doctors who will prescribe it for anybody that walks in." GOP contenders Texas Congressman Ron Paul and former New Mexico Gov. Gary Johnson have taken firm anti-prohibitionist stands on drug policy, but they are finding little support among voters for a party that claims to be for limited government and states' rights. Newt Gingrich's comments on drug policy are only the latest indication that for most Republicans, continuing to fight the war on drugs trumps other party principles. I would vote for Newt but he just lost his chance for the Toker vote. If he would end Federal prohibition and let the states decide he would get my vote but not a chance with this BS! He wants to kill more people for making a choice which is our right. Make it miserable for Americans who use; this guy is another communist! Doesn't believe in states rights. This guy is a complete idiot. I visit your blog and found lot of information and your sharing is such a very useful for me and others really thank you for sharing this great post. Yeah, Yeah, Newt, why is cannabis more terrible than alcohol? , "These kind of addictive drugs are terrible" says Newt. Marijuana more terrible than alcohol, Newt? How many people does alcohol kill, Newt? What about cannabis? Thanks for less than nothing, you wildly hypocritical stonewalling corrupt thug. Executing cartel leaders sounds like a brilliant way to get a whole lot of innocent people killed. An Imperial neofascist and corporate capitalist is in no way a "communist". Newt is a slimy philandering salamander. Note that Newt side-steps the issue of viewing cannabis different from addictive cocaine and heroin AND doesn't seem to have mentioned tobacco anywhere (somebody check the original, I'm too arrogant to take the time). Does he have a position on whether to mix cannabis in with "other drugs" to be tested for in meeting welfare qualifications? When we put all our political clout behind the MEDICAL issue and not emphasize the INSPIRATIONAL (creativity, original ideas, prophecy etc.) functions of cannabis, we let ourselves in for being kicked around, as by Newt here, on the medical (as currently in California) being a fraud to allow a socially disrespected "recreational" use (hey, the real wreck-creational drug is alcohol). Gingrich himself gets media credit for being smart, creative, original etc., so you'd think that aspect of cannabis would appeal to him-- or is he more loyal to his tobacco industry supporters (or those of GOP generally) than to his own ego (let alone the truth)? Before voting for ANY Republican consider that the tobacco industry (that means burning overdose $igarettes) gives twice as much money to Republicans as to Democrats, AND Republican voters are 20 points more anti-cannabis than Democratic ones. God, I hope this moron gets elected! The higher they climb, the more obvious it it is that they need to be brought down, the easier it will be to bring them down, the quicker it will come about, the more illustratively dramatic it will be and, consequently, the more conclusive their demise will be. Save America - vote for morons in 2012! Well he just lost my Vote! I was wondering what his outlook on Marijuana was now I know. I really dont understand where these peoples heads are at I have a pretty good idea but wont share it here but its not pretty. We need to find candidate who supports our position if the true numbers of Voters who are in favor of Marijuana medical use and legalization was really known i believe the candidates would b pandering to us! We are tax paying citizens and productive Americans who deserve to be heard and not treated as Criminals. For those of you who only watch the news sources that marginalize Ron Paul, you must know that he is the ONLY CANDIDATE to vote for if you consider ENDING THE DRUG WAR to be among the most important things a president can do!!!! For the last thirty-plus years, he has on numerous occasions been among the few voices we've had in Congress who've been pushing for the end of this liberty-killing policy! See the discussion of H.R. 4170 and importing "100 usual dosage amounts." Life imprisonment without parole for the first offense, and the death penalty for the second offense. *Newt Gingrich's 1995 death penalty bill for importing 2 ounces of cannabis. Newt is one of the reason my Dad went to war (ww2) To keep the ones like him from taking over our country and freedom.Newt will call for house to house search. The D.E.A will be there to do the work. along with the U.S. Army Don't buy guns they will know u have them. I support executing f*cking retarded politicians. Is that around 50%of American voters are for legalization, and that makes 50% less likely to vote for his sorry azz. I agree with Newt that drug treatment and detox is a much better option than jail time or fines. It at least gets an addict in contact with the right resources to stop using if they so chose to. Do not vote for this man. We must stop the drug war now. The only person to vote into office to end the drug war is Ron Paul. Gingrich is taking our country one step closer, like Obama, to a police state and another civil war, and loss of our personal freedoms and rights. About 3 million of our citizens are being punished right now for their "crime" of possession of an illegal drug, or personal use and are in county jails or federal prisons. This is a crime against humanity and is abuse of the utmost kind. One day in time people will look back and be shocked at what our government has done by way of imprisoning people who don't belong there at all. Vote Ron Paul, let your voice against the "Drug War" be heard, and support LEAP, an organization dedicated to ending Prohibition and the "Drug War." Newt's comments seem a little drastic, but something does need to be done or there will be a lot more problems. The currenty dilemma reminds me of the cocaine cowboys in Miami, when the Colombians brought violence to our streets and there were over 700 murders in one year. Until the bloodshed comes to our country, I do not see much happening with this issue. No matter if some one searches for his required thing,therefore he/she desires to be available that in detail, so that thing is maintained over here.